This husband and wife team is well-known in the art world, and has travelled across the globe in search of antiquities, some that grace their beautifully furnished Manhattan condo and others that they’ve donated to NYC’s most renowned museums. But in recent travels, the normally hardy husband was finding it hard to catch his breath when visiting the temples in Tibet or walking through the hills of Tuscany. When he returned to NYC, his adoring wife made an appointment for him to visit a leading pulmonary specialist at a premier NYC hospital. The diagnosis was hypersensitivity pneumonitis (HP), also known as extrinsic allergic alveolitis, an inflammation of the lung parenchyma in response to inhalation exposure to a wide variety of antigens (NIH) that causes symptoms similar to COPD (chronic obstructive pulmonary disease). Well, given that the best known treatment for HP is avoidance of further exposure to the provoking antigen/allergen, the pulmonologist recommended that the couple’s apartment be inspected by a qualified indoor environmental consultant to “rule out” allergens in their home as the probable environmental exposure trigger of the HP. At the couple’s request, the building’s property manager arranged for an inspection by one of NYC’s better known (well-advertised) consulting firms (who works primarily for landlords and property managers) and sure-enough, the apartment was ruled out. This clean bill of health for the apartment gave the couple some peace of mind and reason to believe that the HP trigger must have been encountered during their far-reaching travels. So they decided to stop traveling for a while – just stay home and enjoy their very active cultural lives in NYC. After all, avoidance of the exposure trigger is the best known treatment for HP. But the symptoms did not subside, they worsened, and further clinical testing suggested that mold was the antigen triggering the HP. That’s when the pulmonologist, whose patients we had helped previously, recommended the couple contact Microecologies. What we found when we entered and walked through the apartment was a beautifully maintained home with no visible signs of an environmental problem – until we started to dig a little deeper into the building’s history and the not-so-obvious surfaces behind the built-in cabinetry. Gaining an understanding of a building’s history is an essential component of a properly conducted indoor environmental inspection, and in this case we learned that there had been a history of plumbing leaks from above (resulting in the replacement of wood flooring) and of wind-driven rainwater infiltration during Superstorm Sandy. When we removed the custom cabinetry covering the fan-coil HVAC units, it was obvious the rainwater had saturated the sheetrock in the suction cavity within the units causing mold spores to be propelled into the indoor air when the units are operating and causing mold growth on surfaces within the units. With a little more digging, we found that the sheetrock behind the cabinetry along an entire wall in three rooms was infested with mold growth as was the adjacent flooring and sub-flooring. At this writing, the couple has discontinued occupancy, the necessary mold remediation and HVAC hygienic maintenance work has been performed, post-remediation clearance has been achieved, and the necessary repairs and rebuild work are underway. With the environmental evidence provided by Microecologies, the couple’s property insurance carrier approved and accepted full responsibility for payment of the remediation and repair/rebuild work. The husband’s HP symptoms are slowly subsiding and the couple looks forward to safely re-occupying their beautiful home within the next few months. 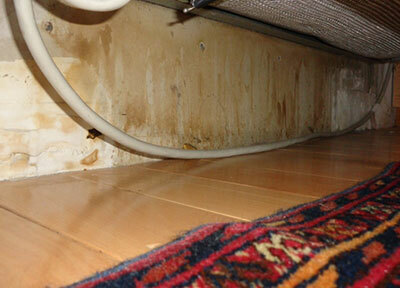 Water damage and mold growth on sheetrock wall under fan-coil unit and behind cabinetry. Mold growth on bottom surfaces of plywood sub-floor.